Another Year of Poor Fish Returns to Pelton Round Butte, Part 1: How Long Will We Let This Continue? The Selective Water Withdrawal tower above Round Butte Dam. Photo by Greg McMillan. The Selective Water Withdrawal tower above Round Butte Dam was designed with an ambitious goal in mind: to return self-sustaining, harvestable numbers of salmon and steelhead to the upper Deschutes Basin. Now, more than eleven years into reintroduction efforts, it’s time to take a close look at the program. In particular: just how many adult fish is the current program actually returning each year? These numbers can be difficult to glean from PGE’s various PR materials, so we’ve gathered the relevant data and present it below. Unfortunately, the numbers tell a clear story: current reintroduction efforts are simply failing to produce meaningful numbers of returning adult fish. Portland General Electric began operating the SWW tower in late 2009. (The first juvenile salmon and steelhead had been planted in upper basin tributaries in 2007). The tower is designed to create surface currents in the forebay of Round Butte Dam (the uppermost of the three dams, and the dam which forms Lake Billy Chinook). In theory, these surface currents would help guide out-migrating juvenile fish through the reservoir to a collection facility at the tower. From there, the fish are trucked below the Project and released into the lower Deschutes River. On this blog, we have frequently highlighted the negative ecological changes in the lower Deschutes River since SWW tower operations commenced. The tower was constructed to draw Lake Billy Chinook surface water—which is primarily composed of Crooked River water—through Round Butte Dam, to ultimately be discharged into the lower Deschutes. Since the tower began operations, river users have observed and documented massive proliferations of nuisance algae, impacts to aquatic insect populations and hatch timing, increased prevalence of fish diseases, and a marked decline in birds and bats. The changes in river conditions are causing real damage to the Maupin economy, and to other people and businesses throughout the region who depend on a healthy Deschutes River for their livelihoods. How Many Fish is the Reintroduction Program Actually Producing? Now, nearly nine years after the tower began operating, it is fair to ask what the people of Oregon are receiving in exchange for these negative impacts to the lower river. Specifically, how successful has the fish reintroduction program been? The often-stated goal for the program has been to re-establish self-sustaining, harvestable numbers of sockeye, steelhead, and spring Chinook above the Project. So how many returning adult fish is the program actually producing? These numbers aren’t easy to find in PGE’s regular promotional materials. Below, we have gathered adult return data from PGE’s annual reports to the Federal Energy Regulatory Commission and from the PGE website. The numbers are not encouraging. In reintroduction planning documents, ODFW identified a “vision of success” of 1,000 returning adult spring Chinook each year. This number is based on assumptions about the ability of available habitat to to produce juvenile spring Chinook. But this year, only 5 (five) spring Chinook that originated above the Project as part of the reintroduction effort returned to the Pelton Trap. This year’s dismal return is down from only 20 returning fish in 2017, and reflects an ongoing downward trend. The numbers of steelhead produced by the reintroduction program are similarly grim. ODFW’s “vision for success” for the program was 955 returning adult steelhead each year. The 2017-18 run year saw only 25 (twenty-five) Project-origin steelhead return to the Pelton Trap. Further, the number of returning steelhead adults has declined in each run year since 2012-13. Finally, only 39 Project-origin sockeye have returned to the Pelton Trap this year. These low sockeye numbers are similar to previous years, with the exception of 2016, when 529 sockeye thought to be of Project origin arrived at the trap. DRA has not seen a numeric target for adult sockeye return goals, but the numbers to this point are considerably lower than what is needed for successful reintroduction. In sum, Project-origin steelhead and spring Chinook returns are lower than any point since the reintroduction program started, and demonstrate a continued downward trend. Similarly, 2018 sockeye return numbers are among the lowest on record. And for all three species, the numbers are orders of magnitude below ODFW’s reintroduction plan goals. 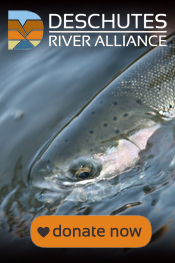 As we have regularly stated, DRA strongly supports the goal of reintroducing salmon and steelhead to the upper Deschutes Basin. But any reintroduction efforts must demonstrate, at each step along the way, a reasonable chance for success—something that cannot be said of current operations. And any reintroduction effort must not harm the water quality and ecology of the Deschutes River below the dams. In short, it is time to re-evaluate the merits of the current fish reintroduction program at Pelton Round Butte. In exchange for ongoing harm to the ecology of the lower Deschutes River, the people of Oregon are receiving just a handful of the promised returning adult fish each year. Despite attempts by the dam operators and agencies to improve return success, meaningful improvements have not been forthcoming. Therefore, we believe it is time for a comprehensive external review of current Program failures, using outside, unbiased expertise. The Pelton Round Butte “Fish Passage Plan,” which is incorporated into the Project’s federal license, contemplates that fish passage using the SWW tower may not ultimately be successful, and that the operators may be required to turn to “non-passage” mitigation efforts for anadromous fish. If an outside assessment of the current program cannot identify operational changes that will lead to a reasonable chance of greater success in a defined time period, then it is time to explore other potential mitigation efforts. The millions of dollars being spent on the current fish reintroduction operations should be quickly diverted to measures that have been proven to produce more adult fish. In particular, habitat restoration in tributaries such as Trout Creek could greatly enhance prospects for wild fish recovery in the basin. ← The DRA’s First Adopt-a-Highway Clean-Up Event Was a Success!